FORT LEE, Va. (Oct. 03, 2008) -- Two dozen of the Army's best Soldiers descended on Fort Lee, Va., Sept. 29, to battle it out for the titles of Soldier and Noncommissioned Officer of the Year. The Soldiers competed in the weeklong "Best Warrior Competition," which includes events designed to test their mettle in areas like land navigation and physical fitness as well as their knowledge of various warrior tasks and battle drills. Spc. David Obray, Army Reserve and Staff Sgt. 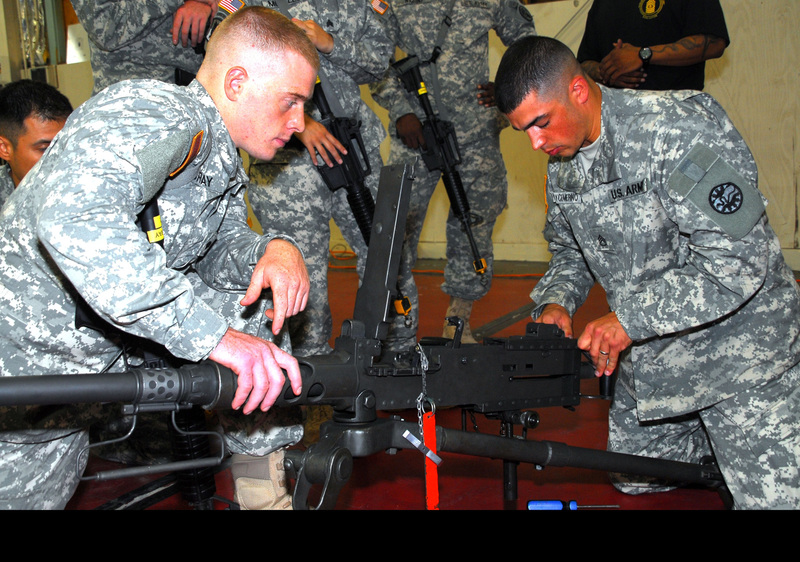 Michael Noyce Merino, Army National Guard, practice adjusting the head spacing and timing on an M2 .50 caliber machine gun during the Army's Best Warrior Competition Sept. 29-Oct. 30 at Fort Lee, Va.
Master Sgt. Derrick Williams, noncommissioned officer in charge of the competition, said everything asked of the Soldiers involved in the competition is something they will need to know to be the most effective they can be in real-world battle situations. "Everything they will be doing here is taken from warrior tasks and battle drills," Williams said. "It's all based on real-world situations like in Iraq and Afghanistan." Two Soldiers from each of 12 Army major commands participated in the competition, a junior enlisted Soldier as well as a noncommissioned officer. The junior enlisted Soldiers compete for the title of Soldier of the Year, while the NCOs compete for the title of NCO of the Year. In order to enter the competition at Army-level, the Soldiers had to face multiple levels of competition from brigade level all the way up to command level. That much competition and training means the Soldiers who made it to Fort Lee are ready to compete, Williams said. "To get to this level, they have to be prepared," he said. "And once they leave here they will have a good idea how to go back and train their own Soldiers and be better prepared to deploy." Spc. Michael Moore, with Alpha Detachment, 1st Space Company, 1st Space Battalion in Stuttgart, Germany is at Fort Lee representing United States Army Space and Missile Defense Command. He said he's trained hard for the competition and feels he'll do well against the other competitors. "Training has been difficult, but I feel I'm in top form right now," he said. "Everything about me has improved, and I think these boards are a great chance to improve on everything Soldier-wise." Moore said of the various events involved in the competition, he feels he'll do best at the administrative board and weapons qualification. Soldiers at the competition have to qualify twice on the M-4 Carbine rifle, once in the daytime and once at night. "I usually shot marksman before I started this process," Moore said. "With the amount of training I've done -- I've shot so many rounds it's ridiculous -- I've improved to expert and my confidence has gone up." An NCO in Moore's unit, Sgt. 1st Class Wilfredo Cabili, helped him prepare for the various levels of competition needed to make it to the Best Warrior Competition. Cabili said Moore has progressed much since they first met. "It makes me really proud to see him come up from where I first met him to where he is at right now -- it's leaps and bounds from where he began," Cabili said. "The hardest part was getting his physical training score where it needed to be. But he dedicated a lot of time and effort to that because he's a motivated Soldier, so he made it easy for me." Spc. Lisa Morales is with the 40th Expeditionary Signal Battalion at Fort Huachuca, Ariz. She's confident she'll max out on the physical training test as well as the weapons qualification. "Those are my two strong events," she said. Though she is somewhat worried about participating in the combatives portion of the competition. "I am a little apprehensive. Being I'm the smallest one here, and the only female, I might get tossed around a little bit -- but I think I can handle myself." Morales is unique among the 24 competitors in that she is the only female Soldier competing. But she says she's more focused on the competition than her uniqueness as a competitor. "Right now I'm very proud and very humbled at the same time. There's a lot of people that would like to be where I am right now -- a lot of people that didn't get to compete for the position I'm in," she said. "Everything we are doing in these competitions reflect what we're going through over there (Middle East,) whether it be Humvee rollover training or reflexive fire or the combat shoot. Even hand-to-hand combatives -- you never know where that might come in to play in Iraq or Afghanistan." Sgt. 1st Class Steven Kroll, Bravo Company, 4/1 Special Warfare Training Group (Airborne), teaches more than 50 weapons at the John F. Kennedy Special Warfare Center and School, Fort Bragg, N.C. He's competing for the title of NCO of the Year and says the competition highlights the things that are truly important for Soldiers throughout the Army to know. "The events are definitely warrior-oriented, to say the least," he said. "And they are extremely relevant in today's situations that we as Soldiers find ourselves in. It's the same basic building blocks I stress to my own Soldiers -- that you have to have the basics before you do anything else. There's probably a group of 20 tasks in my opinion that Soldiers absolutely need to know -- to do the basics of shoot move and communicate and certainly these tasks are some of them." Kroll also said that meeting other Soldiers deemed the best in their commands is a good learning experience, because it allows him to see how other parts of the Army do things. "The competitive spirit that is going on here is great," he said. "Being able to come here and talk with everybody and learn what everybody else is doing in the Army is a real interesting experience. You get to see the different commands and how they operate." Back at Fort Bragg, Kroll teaches weapons to Soldiers passing through the John F. Kennedy Special Warfare Center and School, so he said he's got the weapons portion of the competition down. "The weapons assembly/disassembly is definitely one of my strong points," he said. "I teach more than 50 different weapons, so I think I've got it. Also the land navigation I'm looking forward to." Back home, he has a wife and four kids rooting for him, as well as his parents who he says remain curious about what it is he does for the Army. "That's my little fan club," he said. The Best Warrior Competition finished Friday with a "mystery event," which required competitors be prepared for anything. Winners of the Best Warrior competition will be announced Oct. 6 at the Association of the United States Army Annual Meeting in Washington, D.C. The two Soldiers chosen as the best among the 24 competitors will get prizes, some money and some time off. They go back to their duty station, but will be called upon over the course of the year by the sergeant major of the Army to participate in Army events and to act as goodwill ambassadors for the Army. "This is a training tool that showcases Soldiers to the rest of the world, not just the Army family," said Williams. "Their hometowns will get newsletters and will see them on film. High schools will see them -- it's out in the public and it is a big public relations thing. But what the Soldiers will take back with them are things they don't normally do in their unit, and incorporate those things into their training." Whether he wins or loses, Moore said he'll look back at his experience competing in the Best Warrior competition as a personal gain. "It's an honor to compete at this level," he said. "Making it this far has been extremely tough; it's been a challenge the entire way, but I've grown professionally and personally, just from competing. And I think it's going to be great to take this experience back to my future Soldiers and help them develop as I did."